Discussing Negroni Week with a coworker yesterday quickly saw us googling and stumbling across a rhubarb Negroni. Since I love all things rhubarb and especially the bright red stalks I can pull out of my own garden the name alone had me decided. Then it turned out, that the cocktail contains Zucca an Italian Rhubarb Amaro not in my home bar end a trip to an Italian shop in an obscure part of the Copenhagen harbor was planned for today after work. I will not try to portrait my self as any kind of connoisseur but to me Supermarco appears to be a perfect slice of Italy quite a few degrees North. It's a pretty basic shop but every where you look, there a things you want to smell, taste, touch and buy. Several shelves are dedicated to amari and stronger stuff in the large wine department. So not only did I buy Zucca, I also bought amaretto, Strega and a new bottle of Maraschino. I promptly tasted my new purchase - that is the Zucca - and decided it indeed deserved to be mixed with good gin and red vermouth. 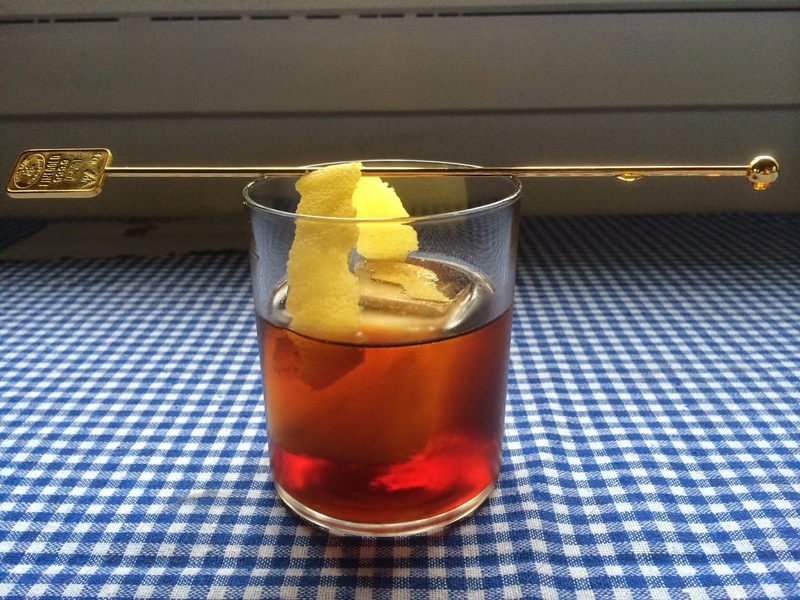 It's an even darker reddish brown than the vermouth and it has a very complex earthy flavor. Quite far from the original Negroni ingredient of Campari with it's medicinal flavor. I measured the ingredients over a big ice cube in a low ball glass and stirred until properly chilled and then simply garnish with a twist of lemon. It's a very satisfying and appetite inducing cocktail - leaning towards liquid Marmite or stock cubes. Until this morning I never knew there was a term as delicious as idiosyncratic certitudes (there is nothing like it in Danish). But then I started reading Robert Simonson's book The Old-Fashioned and came across the term when the author discusses a particular description of making an old-fashioned cocktail from The New York Sun in 1890. The journalist from the Sun states, that only a pestle made of white cedar should be used to gently crush a sugar cube soaked in bitters. It is this certainty that Simonson calls idiosyncratic - and as he points out characteristic of drinkers and drink makers alike. That's when I knew I really loved the book. I had an inkling when I ordered it, but being a Ginhound a whole book about one whiskey based drink would perhaps not be the most obvious choice. Simonson makes it a very easy and fun choice - the book is a joy from cover to cover and made me long to go to my bar cart to mix a drink, but more about that later. 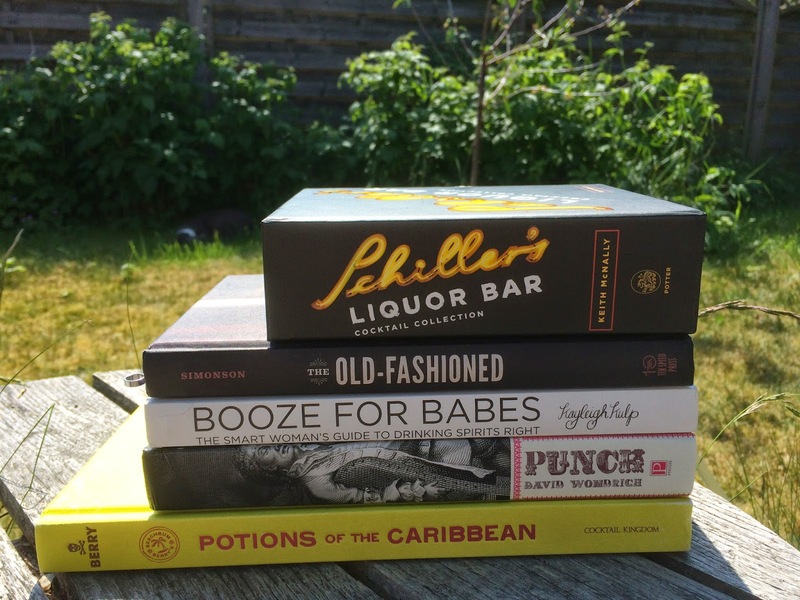 I tried to rank my five favorite cocktail books last september. The moment I did that, I knew I had made a mistake. Much like when newspapers runs articles about the death of the worlds oldest person. Even before the article is published - it's incorrect and old news. Someone else has filled the slot. The king is dead, long live the king. So I'm not going to rank Simonson's book into that system - I'm just going to include it here, when I write a little about four other books about booze I've read lately. I wasn't sure that I would really like Kayleigh Kulp's Booze for Babes - mainly because I myself really don't like to be lumped into a segregated group of drinkers based on something I can't change. 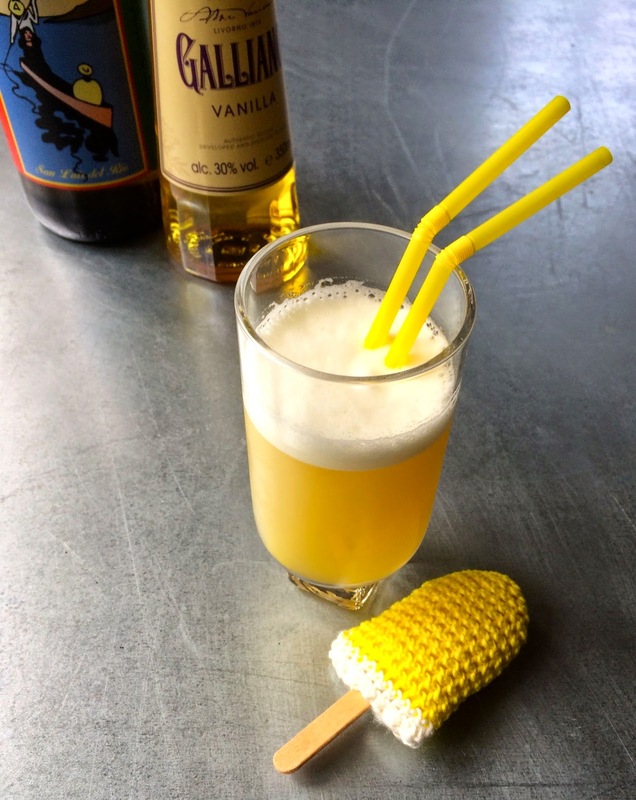 On the other hand what I observe when talking about my passion for cocktails with co-workers are that many women have very set ideas about what they don't like and are quite unwilling to challenge these ideas. Some of the ideas seem to be rooted in what they consider feminine. Which makes it hard when they say: I wish I could make cocktails like you, but I don't know where to start. I want to say: Start by not restricting yourself, but I know it won't go down well. Booze for Babes is a much better start, with some sound advice and it really covers a lot of ground. And personally I've taken the "do not restrict yourself" to heart. I thought I didn't like punch - tried some last summer liked it - and have enjoyed David Wondrich's book on the subject. Punch is the kind of book that makes you feel more and more clever as you turn each page. Wondrich dazzles with his scholarship and manages to pass his knowledge on with effortless style. Even the part of the book that lists punches to make and try is a good read, because the author shares his own tricks and tips to working with these very old recipes in a world several hundred years removed from when they were written. I find quite a bit of the same scholarship in Beachbum Berry's Potions of the Caribbean. Where he admits that he had been swimming in the wrong ocean at the start of his fascination with all things Tiki. It can not have been an easy book to write. The history of rum is not nearly as nice as a Mai Tai made right. Slavery, genocide and every grisly injustice know to man is mixed in there. Berry runs the risk of horrifying the reader with too many details or casting himself as heartless if he does not include enough. He walks that tightrope just right. On top of Berry's excellent writing this is also a really pretty book with lot's of interesting illustrations from everything from the old masters to tourist brochures. The fourth book I will mention is actually the fourth, fifth, sixth and seventh. Schiller's Liquor Bar Cocktail Collection* is a handy collection of four books: One is a quick guide to bartending, one covers some of the Classic Cocktails, one Artisanal Updates and one covers Seasonal Drinks. I like the whole look and feel of the little set - they are almost pocket guides - and the guide is very well illustrated with easy to follow instructions. However as a reader the Artisanal Updates is a pretty baffling read - I suspect unless you have visited the bar - with a little too many martinis and not too many drinks that grab this readers attention. And I wonder why you would sort drinks into a book titled Seasonal Drinks and then not clearly mark the seasons to help the reader figure out which to serve at what time of year. And dare I say - a classic collection without an old-fashioned but including a Moscow Mule is a bit of a surprise to me. I do realize packing the whole library of classics onto less than 100 small pages including photos involves heavy editing, but still. Not least because there is room for another five martinis. So if I can't find an old-fashioned in the Schiller's Liquor Bar Cocktail Collection, I can make one myself. 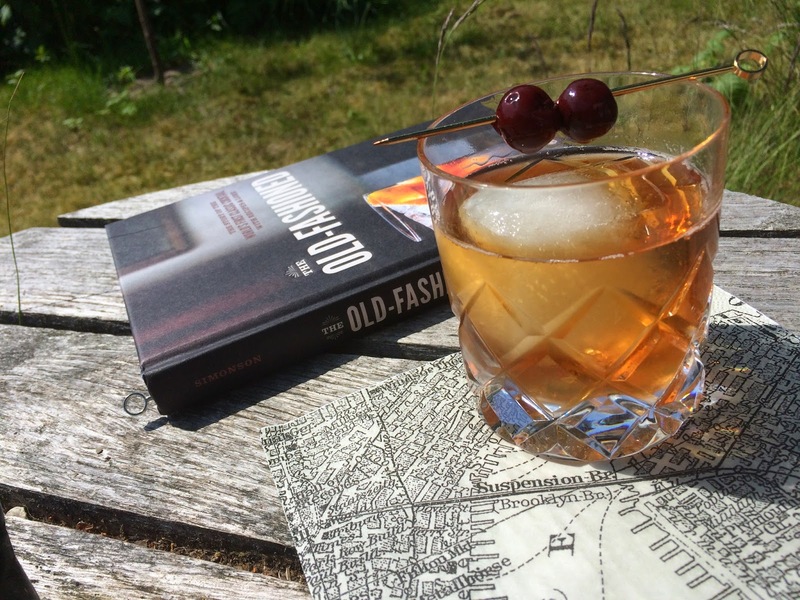 Reading through the recipe section of Robert Simonson's book I noticed a McKittrick Old-Fashioned. And that particular drink have two things going for it: One it's named in honor of the play Sleep No More that I was fortunate enough to see two years ago in New York during a reunion with members of a family who were my host family when I was an exchange student in the US in 1977-78. And the other plus was that the cocktail contains no lump of sugar to be muddled. I would hate to run afoul of Simonson's own idiosyncratic certainty when he advises that a hand-crafted Pug-muddler from New York State is the best there is. I only have two cheep liquor company souvenirs and a horrible mix of steel and lime green plastic. I put the bourbon and the sherry in a whiskey glass with a big cube of ice and stirred 50 times, then added the bitters and garnished with the cherries. * Disclosure: This box set was sent to me by the publishers.